Do you know the secrets to great curb appeal? Making your home look its best is a win-win situation, whether it's for your own enjoyment or because you're preparing to sell. 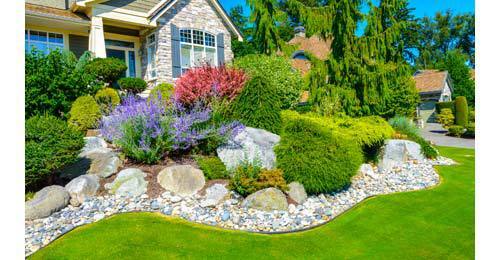 Here are some helpful curb appeal tips to consider. 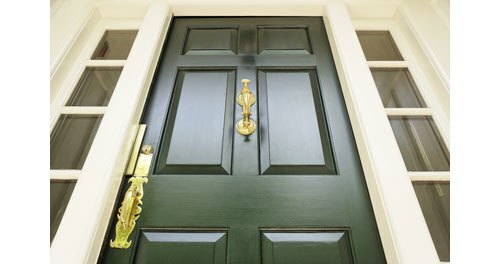 Your front door is often the primary visual anchor point of your home, which is why contrasting colors that catch the eye and draw visitors towards it can be very effective. A strong contrast doesn't have to be created by a deep paint color, even though red and purple doors often work extremely well for this purpose. 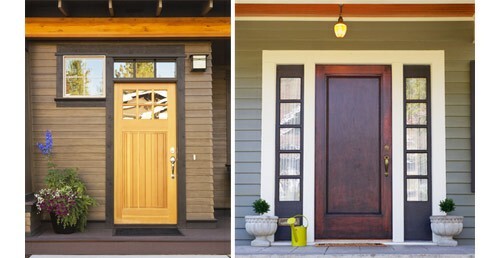 The photo above shows how door trim and side windows can create frames that let the front door "pop" from the street view. Large plants and decorative planters. A portico over a doorway. A trellis, patio, or porch. Window boxes with flowers or plants. Defined walkways and path lighting. See truly amazing "Before and After" curb appeal transformations based on these techniques in this photo gallery from HGTV. Distinct edges along landscaping borders act like the frame on a painting, making whatever is on display easier to appreciate. Tip: This can be easily achieved using a plastic border material such as this no-dig edging product from Home Depot. Plants that need to be trimmed back. Outdoor furniture or anything else that blocks physical or visual flow. An over-accumulation of decor items. Surfaces that need to be pressure washed. Individually these may not amount to much, but together they can reach critical mass and create a sensation of clutter. Tip: Take a picture of the front view of your home and look at it objectively. Photos "add 10 pounds" to houses just as they do to people, making it easier to pinpoint in a photo any trouble areas that may not stand out clearly in person. Visitors standing at your front entry tend to look around as they wait for the door to be opened, and it's amazing how many small details become apparent during that time! A clean front door and shiny kick plate. Attractive door hardware that's in good condition. A clean, sharp-looking Welcome mat. Tip: Take a look at your visitor's path to the entryway. Does anything block the visual or physical flow? If so, you can use colorful container plants or other decor items as anchor points along the way to guide people to the front door. - U.S. home prices rose 5.8 percent year-to-year in March, according to a recent S&P/Case-Shiller report. They rose 6.9 percent year-to-year in April, according to CoreLogic, a data and analytics company. The April Pending Home Sales Index dropped 3.3 percent year-to-year, according to the National Association of Realtors®. This online tool lets you experiment with custom exterior color and material combinations. A simple, low-budget way to dress up a home's exterior with shutters. 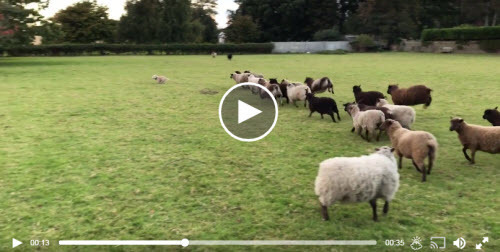 "Not Nelson's Best Day" could be the title of this funny video of a little dog proving that herding sheep (like most things) is not quite as easy as the experts make it look. Click here or on the image above to watch the video on the LittleThings website.